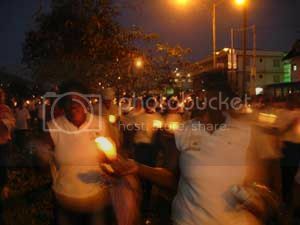 Holding candles which were shielded from the wind by styrotex cups, the crowd walked from the savannah across the road from All Saints Church and the American Embassy to White Hall. 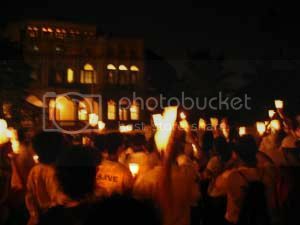 The crowd stood in front of the White Hall with candles in the air, as Part 2 of the Prayer Vigil marathon took place. Prayer Vigil Batons (a special prayer cylindrically rolled on paper and tied with ribbon) were passed to leaders of different communities from across the island (who were present). Love the photos, especially the last. Elspeth, was it just one prayer in all the prayer batons? 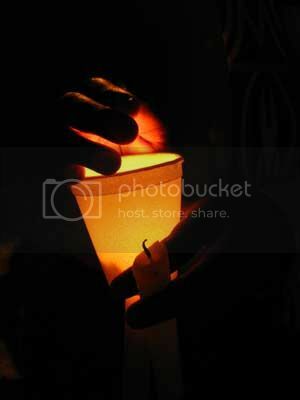 Did any community leader share his/her prayer with you? I'm really interested in the prayer. What a beautiful idea! Yes, it was one prayer. I also wondered what it said, but didn't get to see it there. I'll see if I can get a copy and pass it on here.